Not to be confused with White Raccoon Mario. White Tanooki Mario is a white lucent version of Tanooki Mario. In Super Mario 3D Land, if Mario or Luigi loses five lives in a (skipped) normal world level, an Assist Block containing an Invincibility Leaf will appear. The block emits a tone to alert him of its presence. If Mario takes the Invincibility Leaf, he will become White Tanooki Mario, clad in a white and golden Tanooki Suit. In this form, Mario is permanently invincible until he clears the level, but he cannot earn extra lives by defeating enemies. After that, he reverts to regular Tanooki Mario. 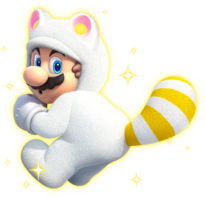 In New Super Mario Bros. 2, a transformation very similar to White Tanooki Mario known as White Raccoon Mario is present, except it is an invincible version of Raccoon Mario instead of Tanooki Mario. 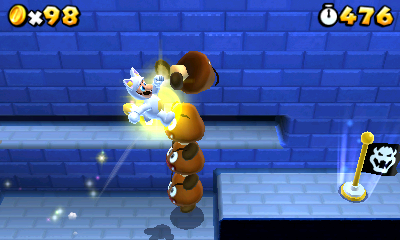 White Tanooki Mario also appears in Super Mario 3D World. The Invincibility Leaf (referred to as the Invincible Super Leaf on the website) once again causes this transformation. The Assist Block holding the item acts as it did in New Super Mario Bros. 2. However, the number of lives lost before it appears during multiplayer mode depends on the number of players (five for one player, 12 for two players, 18 for three, and 24 for four). In Puzzle & Dragons: Super Mario Bros. Edition, if the player loses nine lives in one attempt at a course, Mario or Luigi become White Tanooki Mario or White Kitsune Luigi, increasing the amount of time needed to move Orbs around (approximately thirty seconds), and retains the stats, attribute types and Leader Skill from their previous form. However, the form only lasts for the current section of the level (once all the enemies have been defeated, the leader reverts back to whatever form he was before). The artwork for White Tanooki Mario for every game the form appears in is a flipped version of the original Tanooki Mario artwork. This page was last edited on September 23, 2018, at 13:12.